Bradley H. Sinor has been writing for five/sixths of his life, and has written many short stories, most of them published in a variety of anthologies and three short story collections. His Holmsian collection – The Game’s Afoot: A Sherlock Holmes Miscellany, published by Pro Se Productions – is available on Amazon. His new novel, ‘The Eye Of Dawn’, is forthcoming from Airship 27 Productions. He lives in Tulsa, OK, with his wife, (writer and copy-editor) Sue Sinor, and three cats. He can be contacted on his Facebook page as Brad Sinor. He solved cases others considered impossible. Those we know about. But there were other events taken on by the world’s best known detective and those he called friend as well as enemy that explored, encountered, and even exposed the impossible. And now those tales of terror and deduction are gathered together, stories that pit Sherlock Holmes and those around him against forces beyond mortal man, beyond even this planet. But also, let it not be forgotten that evil need not be supernatural to be truly horrific. 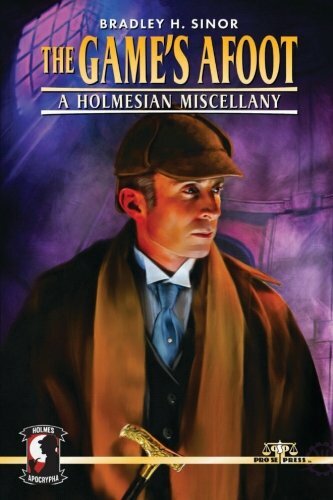 The Game’s Afoot: A Holmesian Miscellany is a collection of tales by Author Brad Sinor that add a facet to the world inhabited by Holmes and characters both associated with him and those who had their own stories to tell. Action, adventure, terror, and mystery await readers as they follow Holmes and others into The Game’s Afoot: A Holmesian Miscellany. From Pro Se Productions.